They will also need to satisfy their internal stakeholders – such as their managers or head office. People sometimes fall down on this aspect. They can get wrapped up in processes or criticise other departments. So it is vital that they deliver success to both their internal and external stakeholders. There are many ways to encourage people to make this happen. 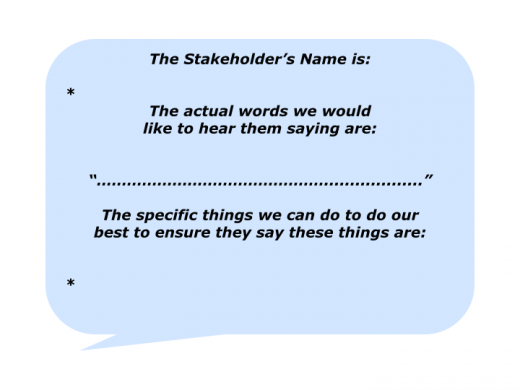 One approach is to get the team members to clarify the actual words they want to hear key stakeholders saying in the future. People can then do everything possible to achieve the picture of success. Let’s explore how you may want to do this exercise when taking over the team. 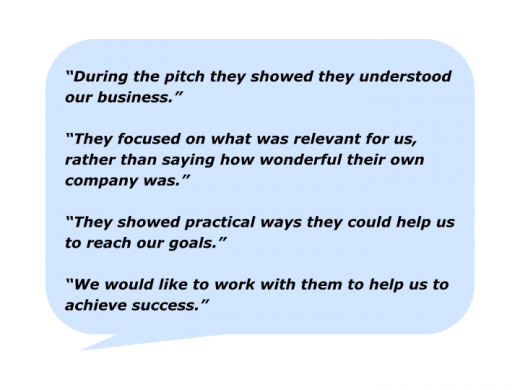 Sales teams sometimes follow a similar approach before pitching for business. They clarify what they want the decision makers to be saying after they have made their presentation. 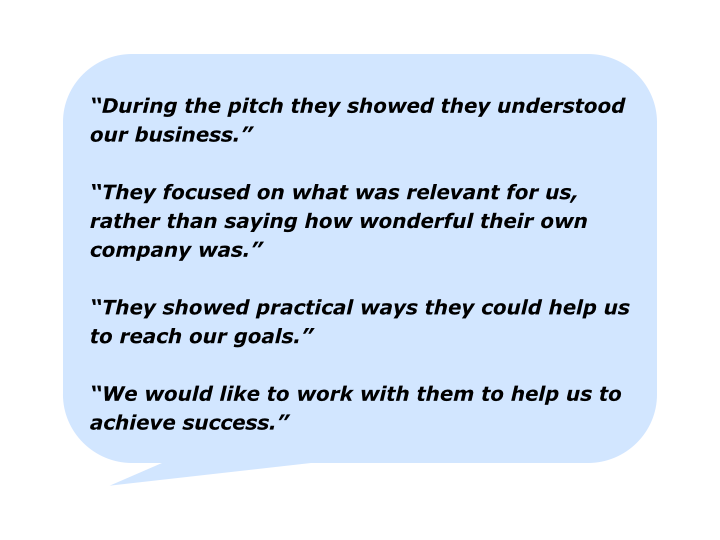 Their answers may include the potential customers saying some of the following things. Imagine you are working with your new team. You can invite them to go through the following steps to achieve success. The internal stakeholders will include the managers to whom they report and other key people in the organisation. It is vital to deliver the goods to these people – otherwise life can be difficult. The external stakeholders will include all their customers. They can write the actual names of key people within each of these accounts. Again, it will be vital to deliver success to these people. Some time ago I ran a session for 30 people in a pioneering company. They identified several groups of stakeholders. These included: The Potential Buyers; The Venture Capitalists; John, The CEO; Sue, The Managing Director; The Customers – these were broken down into long-term customers, new customers and prospective customers; The Colleagues – the people working in the company. Your team will have its own list of stakeholders. Once these have been established, you can invite people to take the next step. 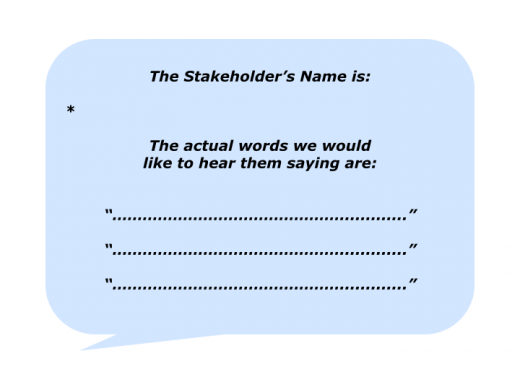 To brainstorm and then agree on the actual words they would like to hear the specific stakeholder saying. To make sure these are actual sentences – rather than management phrases – and to bring the sentences to life by giving examples. “The team has got its act together. They keep me informed about their progress towards achieving the goals. There are no surprises, so I don’t have to worry about them. Let’s assume that the team members have completed this stage. They can then move on to the next step. To clarify the stakeholder’s picture of success. To clarify the Dos and Don’ts for working well with the stakeholder. To be positive, professional and make clear contracts regarding what they will deliver – and when – for the stakeholder. To provide great service and proactively inform the stakeholder about the progress towards achieving the goals. To, when appropriate, present possible solutions to challenges. To continually clarify: a) What they are doing well regarding the service they are providing and how they can do more of these things; b) What they can do better in the future and how. To continually improve their professional offering and do what they can to help the stakeholder achieve success. Different teams use this exercise in different ways. Some complete the flip charts and then put them around their work place. Others use them as wallpaper for their computers. Great service givers keep referring to these aims. They then do their best to ensure their stakeholders are saying the desired things. Here is the final exercise you can give the team. Invite them to complete the following flip chart and focus on doing these things to help each of their stakeholders to achieve success.